@RogerRoger I can't buy a game and not load it up immediately. I don't think I've ever managed to, actually. I don't understand people who say they bought XYZ game a year ago and it's still in shrink wrap on the shelf! Usually, I'm with you; I play games the day they're released, and it's only because I'm on PushSquare that I take a snapshot of whatever I've purchased to post here before opening it up and installing it. But with such a crowded release schedule this year, there have been the odd moments where I've waited for an appropriate time to start something, only by a day or two. The exception to this rule is Shenmue I & II Remastered, which is still shrink-wrapped on my shelf because it had the misfortune of coming out a week before everything kicked off. So I guess you could say I unwrap things when I'm ready to play them; I'm just usually better at being ready to play them on release date. Anyway, it's open now. Took ages to install, though! After a 200$ present, I got Dissidia Final Fantasy NT, Guilty Gear Rev 2, and Kingdom Hearts 2.8. Would've got Red Dead, but I thought it was best to wait until I got MGSV and Type-0 out of my backog first. @RogerRoger I’ve been a little bit AWOL lately with just spare minutes here and there for a brief PS check everyday — so I’m a little late, but in case I missed it, I am anxiously anticipating your impressions of Just Cause 4 when you have some. If you already do, then direct me to the appropriate thread because I’d love to know if the game is going to live up to the lofty promises in the promos. @Th3solution I very nearly tagged you the other day, just randomly, to make sure you were alright since you've been posting less frequently... you've been missed (but no pressure to be here every day, obviously, just hope it wasn't for a bad reason)! I've spoken about Just Cause 4 in the "What PS4 Games Are You Currently Playing?" topic twice, both on the most recent page. Put simply, it's the same great gameplay but with a serious graphical problem preventing me from becoming addicted. I played it for about four, maybe five hours on Tuesday, but yesterday I went back to Hitman. I'll be playing as Rico again later this evening, but the moments of genius have been dragged down by the overall lack of quality, and I'm not sure how long it'll hold my interest going forward unless there are some major improvements to the game's appearance, interface and options. The reason it's been getting great review scores (mostly eights) is because all advance review copies were for the PC, upon which it looks gorgeous. I'm eagerly awaiting PushSquare's review in particular, and the Digital Foundry cross-platform analysis, because there's no way anybody can enjoy the game without the visuals being a major distraction (and I'm no graphics snob, either). I'll try and share some screencaps. Already posted one on the PushSquare PS4 Community. @RogerRoger I've seen a 6 for the PS4 version. Not read it all yet, but for the 'cons' in the summary section, it did not mention any of the bugs you have experienced. Just traded my copy of the awful Call of Cthulhu for a pre-owned copy of Dragon Quest XI! @JohnnyShoulder That's interesting. When I mentioned my concerns in the comment section of PushSquare's review round-up article, I had many people agree with me, but one person disagreed and said that the graphics were fine, but that they were playing on a base PS4 and not a PS4 Pro. I'm wondering if there's any difference and that somehow the PS4 Pro is trying (and obviously failing) to do something extra. Here's the shot I posted on the PushSquare PS4 Community. It's a completely still landscape shot from a major cutscene early in the story. 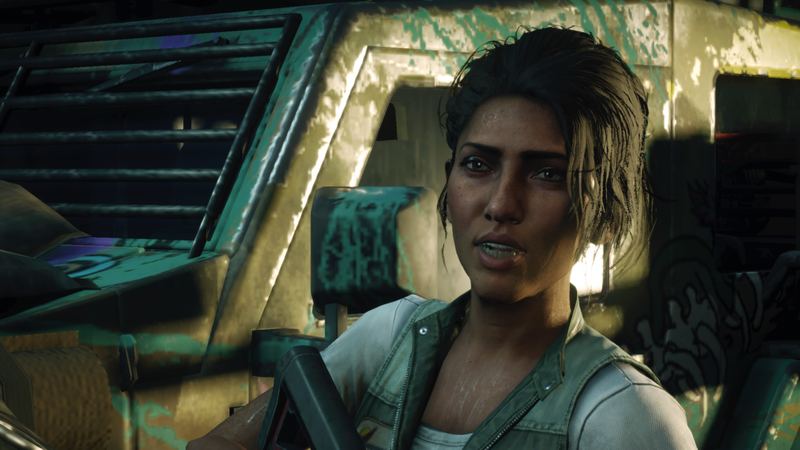 Here's another; this was during a cutscene rendered in real-time, and the texture of the Jeep behind her? That's fully loaded. I kept waiting for it to pop in, and hung around after the cutscene walking slowly around said Jeep for a full minute... nothing. This is what everything looks like in-game. Character models frequently don't pop in at all, or pop in three seconds before the cutscene ends. Hair has a weird lighting bug which means Rico's beard periodically glows, revealing the texture map of his face. As soon as you move the camera, everything becomes insanely blurry and impossible to track (to the point where I had to dial the analogue stick sensitivity down from a default 80 to a more useable 40, which leaves me feeling a little sluggish in combat but at least I can see what I'm doing... and that's about the only useful thing you'll find in the options, by the way). 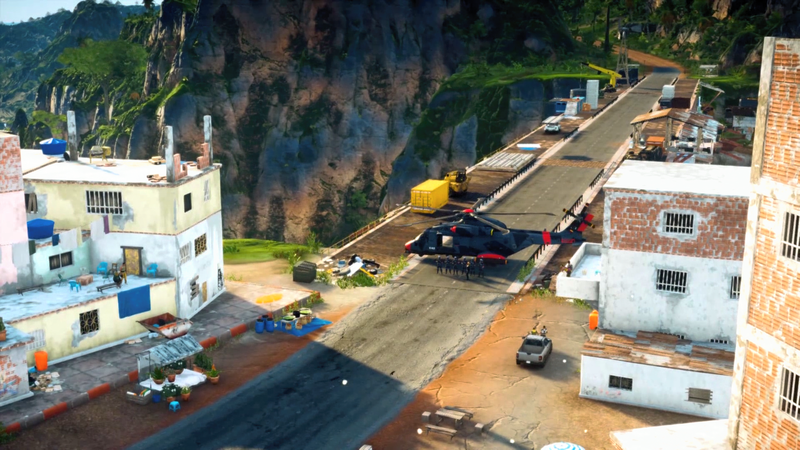 Just Cause 3 may have been rough around the edges, but at least it felt finished and sufficiently current-gen. This just feels like a really lazy remaster of an early PS3 game. Again, a shame because the gameplay is a heck of a lot of mindless fun. @RogerRoger Thanks for the response and the info about the disappointment of JC4. I did find the impressions on the other thread to read as well. Its too bad about the graphics. For the type of game it is, there really is a minimum standard of graphical fidelity that is acceptable and it seems like the game can’t quite hit that mark. We’ll see how it comes along with any patches. ...And thanks for thinking of me. I appreciate the conscientiousness of our community. I’ve been pretty busy and so I’m very far behind in keeping up with some of the chatter in the forums and articles. I feel so disconnected! @RogerRoger I was surprised when they announced the release date, it is such an odd time to release a game. This would be a perfect game to play after the truck load of spring releases. But then again they are working on RAGE 2 and that is out in May. Hopefully that will be more polished cos I'm very much interested in that game. Square Enix do not have a great history with some of the developers. I remember hearing story about JC3 and how SE wanted it to be a online only game kinda like Fortnite, but changed their plans only a few months before it was due to release. So maybe they put pressure on Avalanche to release now. EDIT: Oh and I wasn't casting any doubt on your impressions of the game or anything, soz if it came across that way. @Th3solution Well, having played four more hours yesterday evening and this morning, I can safely say that the gameplay's the same excellent blast as before. I stole a stealth warship from a naval base (which I promptly tore to pieces with the stolen warship's deck guns) and infiltrated an airport by executing a perfect landing and quietly taxying to a hangar... which I then blew up, of course, before making all the other bits of the airport explode, too. It's a heck of a lot of fun. But the graphical problems and glitches were with me every step of the way. I'll tag you over in the screenshot thread, because I don't wanna derail this topic, but some of it just took me out of the experience, to the point where I'm having to enjoy this because it's now "the buggy sandbox game" instead of a great new release. It's making me bolder in my playstyle, though, so maybe it's a weird kinda good way to look at it... but not for £80. If it was £20 or less, I wouldn't feel quite so betrayed by all the pre-release marketing. And as for the forums, we're not going anywhere (I don't think)! Life is life and we all understand, but the place ain't the same without you, so hope you can drop by as much as possible. @JohnnyShoulder It certainly feels like it's a line item in a stockholder report; Just Cause 3 was also released in December a couple years back and it obviously worked for them, so they thought they'd give it another shot. It was announced alongside everybody else's announcements for this crazy release window we've been enjoying, so perhaps they just didn't realise their mistake until it was too late. The game certainly could've used some extra development time! And don't worry, you didn't. It was more that your post made me realise that I was criticising an aspect of a new game that hardly anybody else was playing, and I should've been providing evidence to back up my claims. The graphics tricked me into thinking I was playing an old PS3 game because I forgot about the Share button for a while! I'll tag you in the screenshot thread, too. Just got Detroit Become Human in the weekend sale on the PS Store for 18 quid. Came with a digital artbook, soundtrack, thehe's and avatars (which are awful lol). @JohnnyShoulder That’s such a sweet deal. I’ll be interested to hear how you like it! @Th3solution Cheers man, and thanks for your in depth comments on the game. It was that and my experience with Beyond that made Detroit go from a maybe to a must buy. Hopefully I'll get round to play it this side of PS5 lol. Just nabbed a sealed copy of Monster Hunter: World for a cool $20! I decided to buy Dragon Quest XI on the PS Store while it was still on sale, so I got it for just under $42. My Christmas bonus should be enough to cover that & Smash. Monster Hunter: Wolrd. I got it to play with a friend. The sales strike again as InFamous Second Son & Senran Kagura Estival Versus are added to my library. Nabbed Tetris Effect on Ebay. Can't wait to try this! @Ralizah I really want to try that game. I don’t have VR but it looks brilliant enough in 2D. I’m just waiting for a little bit of a price drop. @Th3solution I got it for roughly $30. Maybe a bit much for Tetris, but I can see myself putting a lot of hours into it. If you're U.S.-based, Gamestop has it on sale for $20 right now.